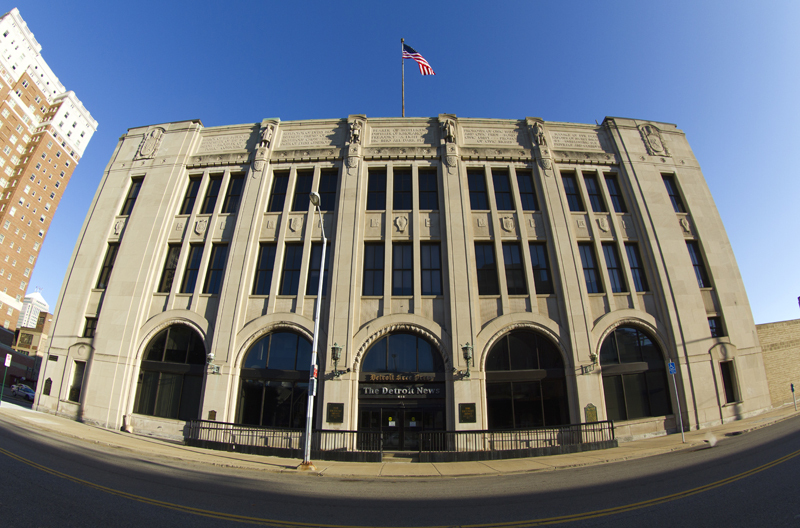 The former home of the Detroit Free Press and Detroit News. Photo by Steve Neavling. Unionized journalists at the Detroit Free Press sold out their designers and copy editors after approving three-year contracts that include raises and a signing bonus. Under the agreement approved Sunday, dues-paying copy editors and designers will lose their jobs in 18 months after the newspaper outsources those positions. But the journalists who will remain – reporters, photographers and editorial assistants – are set to receive a $700 signing bonus and raises of 1.5% during the first two years and 1% in the third year. Journalists also will retain their health care benefits without additional out-of-pocket expenses under the contract between parent company Gannett and the Newspaper Guild of Detroit Local 34022. Free Press employees had been operating without a contract after negotiations stalled. Two copy editors who spoke on condition of anonymity said they feel betrayed by fellow union members. The Newspaper Guild did not return a call for comment. Gannett, which owns more than 100 newspapers in 34 states, is just the latest beleaguered media company to outsource copy-editing and design jobs. Despite the company’s financial struggles, Gannett announced Monday that it was trying to acquire the Tribune Publishing Co., another large newspaper company that owns the Los Angeles Times and Chicago Tribune. As if the damn JOA wasn’t bad enough…. Probably not a surprise to those paying attention. Back in the day at the mighty Oakland Press, when the place started leaving reporter positions unfilled once people fled, I remember a sunny conversation where I was confronted by a writer (an above-average writer, IIRC) who wanted to know why the copy desk wasn’t feeling the cuts. I replied that we had, and then I followed up with a brief-as-possible synopsis of all the work the smaller desk was then doing. This seemed to have a small effect at first, but I could tell that within hours, this person would likely return to his original viewpoint. Today’s newspapers view editing and quality as overhead, and they have for some time. Was the $700 signing bonus paid in 30 pieces of silver at a time? Well Steve, I guess you got out at a good time. It might not have happened the way you wanted but at least you left with your soul. you didn`t sell it for seven hundred dollars. Thank you! It was a hidden blessing to leave when I did. The news and free press haven’t been real newspapers for decades. They are both run by fascist trying to buy “freedom of the press”. The JOA is a state supported farce and is just more evidence that the economy is rigged. Boycott both papers and bankrupt them. The pic of the sad old News Bldg. is an apt accompaniment to this doleful tale. The top floors are now occupied by some fly-by-nite Health care scam but maybe St. Dan Gilbert can lease out the cavernous bottom for a Labor History mausoleum/museum and gift shop ! Almost a couple decades ago… Detroit’s unions were ALL effectively broken because of Gannetts’ dagger- like initiative directed at the newspaper unions ( Newspaper Guild included ) from that looming old Gray Lady of a bunker . Only a visionary corporado could have imagined that the collateral damage would take out everybody else too… but the antiquated rules of decorum governing official ‘labor relations’ in this devastated land ( USA ) allow for reasonable pretence & ludicrous public relations rhetoric to prop up any number of ersatz ‘unions’ in the absence of reality based proof . And… come to think of it, in the absence of any Labor beat reporters who could sniff out the fiction. It’s becoming quite obvious the future of journalism is an independent news gatherer with a smartphone, not some antiquated dinosaur like the Free Press. Unfortunately, the question is whether they will be able to make their voices heard without the hinderance of Google and Facebook. Even large news sources, their online stuff loses money still. How does a little guy get paying clicks, its a real problem. Something like 85% of online revenue goes to google and facebook. Everyone else slices up whats left. Yes, journalism now belongs to high school dropouts and TMZ wannabes who can’t put two words together and think a great pay scale involves being able to afford a microwaved burrito at 7 Eleven. I wouldn’t be surprised to see that happen. Reporters are taking videos and photographs with their phones now. And it looks pitiful. Not to mention, the consistent use of stock photos in the online publication. It’s pathetic. They use the same classroom shot for almost every story about education and a stock photo of police tape “do not cross” consistently for crime stories. I guess it’s cheaper and easier to pay Getty Images than hire a competent photographer. LOL- I made a “Note to self…” recently, “Never EVER let anyone take pic of me in my classroom…” or it may end up being the one used for everything from, “More and More Teachers with Advanced Certifications in the Classroom,” to, “Poorly Trained Teachers Now the Norm,” which is what has happened to a colleague of mine! !